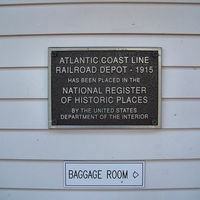 The U.S. National Register of Historic Places plaque at the Mount Dora Train Station, located at 341 North Alexander Street in Mount Dora, Florida, in 2007. 1886 was when the first railroad stopped in Mount Dora, connecting Jacksonville to Tampa. The Mount Dora Depot cost $8,223 to build. The last passenger train left Mount Dora in 1950 and freight was discontinued in 1973. 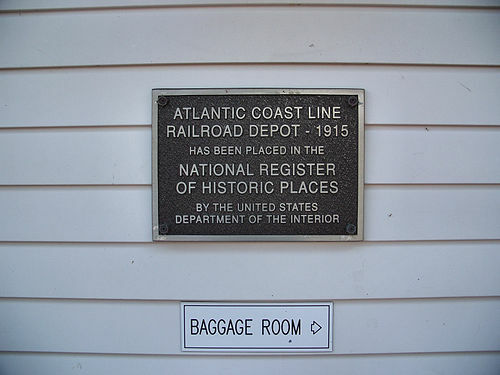 On March 5, 1992, the station was added to the U.S. National Register of Historic Places. Original color digital image by Ebyabe, May 20, 2007. Originally created and owned by Ebyabe. Homan, Lynn M., and Thomas Reilly. Mount Dora. Charleston, SC: Arcadia, 2000. Ebyabe. “Mount Dora Train Station Historic Marker.” RICHES of Central Florida accessed April 24, 2019, https://richesmi.cah.ucf.edu/omeka/items/show/5109.